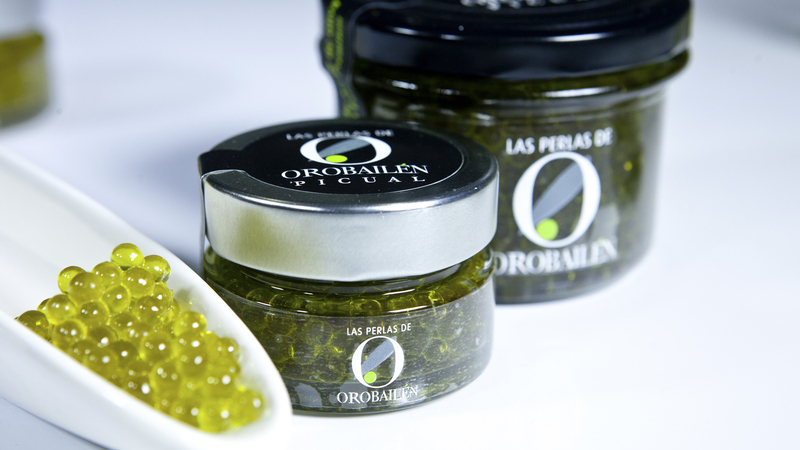 Discover the wonderfull EVOO Oro Bailén Pearls. Uniform seamless capsules, diameter between 5 and 8 mm, composed of a membrane of sodium alginate (E-401) (from seaweed), and a filling of extra virgin olive oil Oro Bailen Picual / Arbequina Family Reserve. They are thermo-reversible and have high thermal stability, withstand temperatures up to 100ºC. The stability and mechanical strength of the capsule allow you to add the product and mix it with other foods without damaging the membrane. Extra Virgin Olive Oil Oro Bailén Picual and Arbequina, Water, Sodium Alginate (E-401), Calcium Chloride (E-509). High content of oleic acid and olive oil polyphenols that contribute to the protection of blood lipids against oxidative damage. Oro Bailén pearls are ideal for dress any type of recipe, be it cold or hot, vegetables, meats or fish, also adding a magnificent presentation. Shelf life 18 months approximately in the original hermetic packaging, keep in a cool, dry place and protected from light.